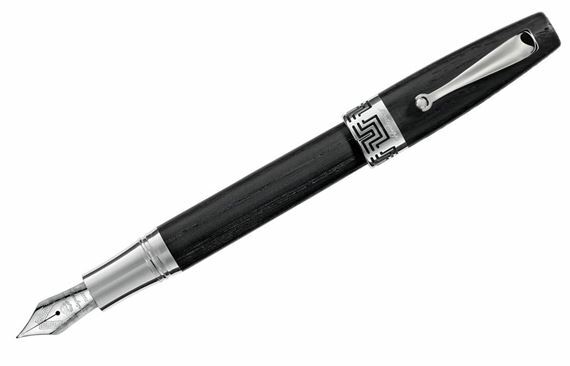 Order your Montegrappa Limited Edition Extra Riverwood Fountain Pen today from FahrneysPens.com. Fine Pens, Refills & Luxurious Gifts – great prices & fast shipping. The new re-style of the legendary Extra 1930 Fountain Pen boasts all iconic Montegrappa product features, except for one! The sleek trim in polished Sterling Silver is subtly coupled to a rare and very precious natural bog oak, instead of celluloid. This unique instrument is made with a certified 4200-year-old wood, retrieved from the depths of Mother Earth. Its premium qualities are bathed and exalted by the constant flow of waters over the centuries, thus instilling the Extra writing instruments with a truly subtle elegance and somewhat mysterious allure. The nib of the Extra Riverwood fountain pen is crafted in solid 18K gold, finely etched with Montegrappa’s classic Greek fret motif.